Vedic Mathematics is based on sixteen sutras (Mathematical formulas derived rom Veda) which is presented a renowned Hindi Scholar Sri Bharati Krishna Tirthaji Maharaja. 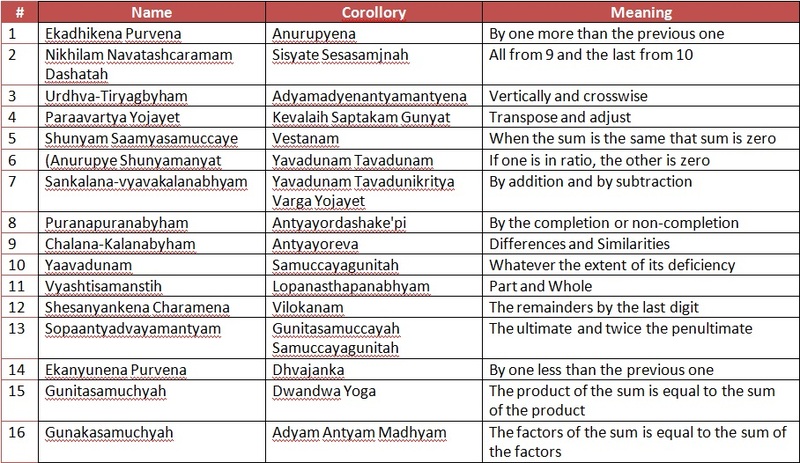 Here is the list of sixteen Sutras and thirteen sub sutras that drive the Vedic mathematics concepts. These sutras can be applied in various ways for faster calculations in arithmetic’s, algebra etc. 1) Ekādhikena Pūrvena – “ By one more than the previous one”Ekādhikena Pūrvena “By” The sūtra means that the prescribed arithmetical operation is either multiplication or division. Both are implied since we may proceed leftward and multiply (and carry-over the excess value to the next leftward column) or we may go rightward and divide (while prefixing the remainder). When dividing by a nine’s family denominator, the digit to the left of the nine (previous) is increased by one to obtain the multiplier. Parāvartya Yojayet, is applied for arithmetic division and division of polynomials by Vilokanam (mere observation) by column-wise notation. The use of the Ānurūpyena Sūtra to multiply or divide the quotient proportionately to bring it closer to a power of ten, eases the calculations. 5) Sunyam Samya Samuccaye – “Samuccaya is the same, that Samuccaya is Zero.’ i.e., it should be equated to zero. Upasūtra Sankalana-Vyavakalanābhyām is used to solve a second special case of simultaneous linear equations where the x-coefficients and the y-coefficients are interchanged, immediately giving two equations with the values for (x+y) and (x-y). Purana is well known in the present system. We can see its application in solving the roots for general form of quadratic equation. The Gunaka-Samuccaya Sūtra, etc., deal with successive differentiations. Knowing the relation of the factors of a polynomial and successive differentials of that polynomial and with the use of the Ādyam Ādyena Sūtra (on the sum of the coefficients) one can factor polynomials, even ones with repeated factors. 16) Samuccaya Gunitah “The factors of the sum is equal to the sum of the factors”It is intended for the purpose of verifying the correctness of obtained answers in multiplications, divisions and factorizations.